Westchase is a beautiful city inside Hillsborough County, FL. Well-known for its high class school system and wonderful neighborhoods, Westchase is a staple of Hillsborough County. People from far and wide look to settle down in the amazing part of town when they move in the area. Westchase has a population of well over 21 thousand people. 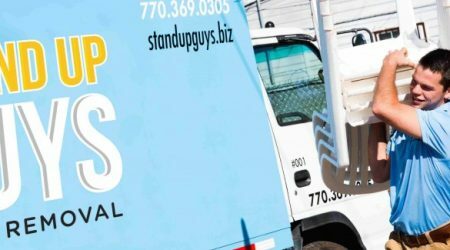 All of which have the luxury of being catered by the best junk removal company around, The Stand Up Guys Junk Removal Crew. Yep, The Stand Up Guys cover all of Westchase and more. We help all the residents of the community with all their junk removal, debris removal, clean outs and labor needs. If you live in Westchase you can count on The Stand Up Guys. The Stand Up Guys not only remove junk and debris for the people and businesses of Westchase, we also give back as much as we can as well. We give back by donating and or recycling more than 60% of the items that we pick up in the area. This way we save the dumps from overfilling with frivolous things and we give back to those in needs. There are over 28 neighborhoods and 9,000 homes in Westchase and the Stand Up Guys serve every last one of them. You won’t find better customer service or value on your junk removal needs then with The Stand Up Guys. The Stand Up Guys Junk Removal Crew cover all of Westchase and all the surrounding cities from our central location at 1907 W. Kennedy Blvd Tampa, FL 33606.